Each of the major tournaments has three licensed courts, though the clay at Roland Garros looks much lighter here than the real thing. Player likenesses are generally very good, particularly when it comes to the classic characters like McEnroe and Borg. But there's not enough care in the animations. Sampras' loose-shouldered, almost simian posture while receiving is spot-on, yet his service action is robotic. Indeed, that's a persistent problem - Roddick's whip-crack serve slams down with a ferocity that no other player can match, but it'd be even more satisfying had his technique been properly replicated. For a company that prides itself on verisimilitude, there are a number of glaring omissions. Where are Djokovic's elastic-limbed stretches, or Nadal's buggy-whip follow-through? The shrieks and grunts that accompany each shot might be authentic, but too often the animations - even when it comes to celebrations - are generic. There are exceptions, with Andy Murray proving appropriately inconsistent, thundering down double-fisted backhand returns and making far too many unforced errors. If it often feels like you're facing reskins of the same two or three players, the on-court action all but proves it. 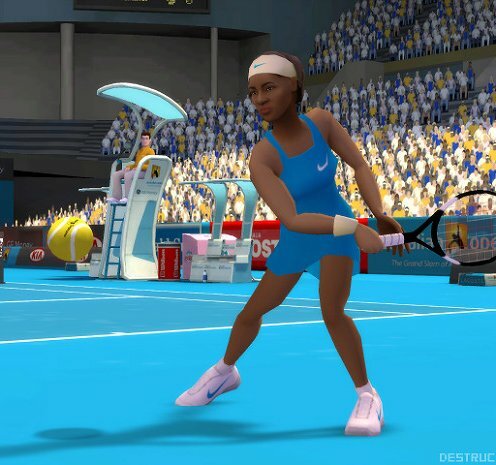 Curiously, on the lower difficulty levels your opponents play more like the real thing, but in Pro and Superstar modes it seems everyone fancies themselves a serve-volleyer. Witnessing the likes of Murray and Nadal rushing forward on every rally is all the evidence you need to prove early suspicions that net play is overpowered. In Career and ESPN Grand Slam Classic modes, you can earn extra points for achieving bonus objectives - like hitting a given number of backhand winners.